One could make the argument that Vasiliy Lomachenko—not Lionel Messi, not Antonio Brown, not Roger Federer—possesses the best feet in sports. This story originally was published on May 9, 2018. Vasiliy Lomachenko will face Anthony Crolla in a lightweight title bout Friday in Los Angeles. 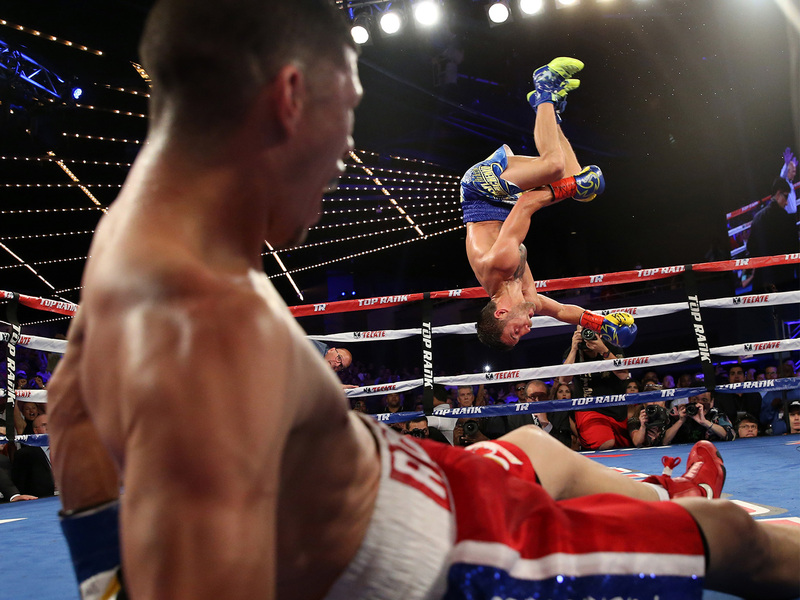 OXNARD, Calif. — The best feet in boxing were born to breakdance. At least that’s what Vasiliy Lomachenko says. As a child growing up in Ukraine, he’d sneak off with his friends after workouts, find cardboard boxes, lay them flat and perform windmills and headspins, while break beats boomed over portable speakers. That all changed one day, when Lomachenko was nine years old and his father, Anatoly, asked him two questions he already knew the answers to. Did Vasiliy like to dance? Did he want to become a great boxer? Vasiliy nodded, answering yes to both. Now, as Lomachenko prepares for his latest title fight, his emphasis on movement continues unabated, decades after he swapped the pantaloons for boxing trunks full time. He recognizes what might not be obvious to casual observers who see the knockouts, the power in both hands and the opponents who quit mid-fight rather than endure even another minute inside the ring with him. “All the power, all the coordination, all my victories – everything comes out of my footwork,” Lomachenko says. Lomachenko believes that footwork, regardless of sport but especially in boxing, separates transcendent athletes from simply great ones. He realizes that might sound strange, coming from a boxer with eight knockouts in 10 pro fights, coming from someone whose fists should be prohibited as weapons by TSA. But when Lomachenko watches old clips of some of history’s best boxers, everyone from Sugar Ray Robinson and Muhammad Ali to Mike Tyson and Roy Jones Jr., he sees dancers as much as he sees boxers. Someone told him that Robinson once said he liked to do his road work on the dance floor and he filed that quote away, because it reminded him of all that studio training. “Maybe that’s why my father put me in those classes,” he says. Mr. Lomachenko put his son in everything, planting those now famous feet on soccer fields and wrestling mats and in swimming pools. Anatoly did that to build the perfect boxer, step by literal step, and now, as Lomachenko stalks opponents, eliminating escape routes, pinning them in corners, every step is by design. TV: ESPN+. Click here for a 7-day free trial. A mixture of tortured Russian ballads and throbbing deep house played over the speakers at the Oxnard gym where Lomachenko trains. He didn’t have his hands taped for the first 90 minutes of his workout, focusing instead on movement, conducting a series of choreographed steps with a training partner. Sometimes they went 10 minutes without throwing a single jab. The atypical is typical for Lomachenko. Between fights, he trains by riding horses, playing soccer, driving racecars, swimming in the Black Sea, wrestling and running the occasional marathon. He’s the captain and star forward of a local Ukrainian hockey team in the winter. In camps, he’ll do wheelbarrow crawls or handstand walks. He’ll also juggle, take hundreds of 3-pointers, kick a hacky sack or play one-man tennis, hitting lobs then running around the net to retrieve them. “He’s like a modern Bo Knows,” Flores says, referring, for those under 30, to Bo Jackson and his ubiquitous Nike ad campaign. Whatever works. Team Lomachenko studies long-distance runners, triathletes and elite ski racers. They have hired NFL speed trainers and Finnish massage therapists. They even track data from the computer chips they place inside his hand wraps for sparring sessions, like the one he had the day before, when he went 15 rounds with three different opponents. None of Lomachenko’s training methods are unusual—at least to him. “I’ve been training like this all my life,” he says. There’s a point to all the variance. His father started with the footwork, then honed the fundamentals, then borrowed from this sport and that sport, from this method and that style, to create an amalgam of activity designed to better coordinate his son’s movement both inside the ring and out. He wanted Vasiliy to be able to recognize not only when an opponent is out of position but when he will be, and to then position himself relative to where that opponent will eventually move so as to inflict maximum damage. He saw boxing as active, coordinated, painful chess. Painful, that is, for others. To that end, Lomachenko added a sports psychologist to his staff in 2011, long before mental coaches became the latest thing in sports. Their shrink is Andriy Kolosov, and he sees his job as adding to Anatoly’s masterpiece. If the father had created a boxing artist like Picasso, it was Kolosov who gave Lomachenko more colors with which to paint. They do psychological workouts after their boxing ones, using numerical charts and reaction timers, the exercises grounded in Soviet-era training methods, where Lomachenko essentially problem solves while tired, sore and under duress. Kolosov says those exercises help Lomachenko retain his focus while in actual matches, so he feels less pressure in the ring and can be more creative in the way he fights. Kolosov calls this “tactical thinking” and “training for situational possibility,” which are technical ways of saying they allow Lomachenko to win the most important fight in boxing—the fight for position. What he makes look easy actually took years of specific, scientific training. Some boxers are simply elite athletes; Lomachenko is an elite athlete who hones his athleticism rather than relies on it. The first time his manager saw Lomachenko box, Klimas knew that Lomachenko was a different type of fighter. Feet over fists. That was obvious, even then. Klimas also knew the results produced by that combination, the 396-1 record as an amateur, the Olympic gold medals that Lomachenko won in 2008 and ’12, the world championships he secured in ’09 and ’11. In 2013, Klimas flew Lomachenko to New York City, picked him up at baggage claim at JFK and introduced him to several promotional companies. The boxer’s stated aims were as different as his training methods. He cared less about money, or easing into the U.S. market. Instead, he chose Top Rank Boxing because its chairman, Bob Arum, promised Lomachenko he could fight for a world title in only his second pro bout. Lomachenko actually lost that first title fight, by split decision to Orlando Salido in March 2014. But that defeat–to a tough, plodding, roughhousing opponent who came in overweight and utilized what could fairly be described as questionable tactics–only underscored the importance of Lomachenko’s footwork. Salido had bullied that away from him. 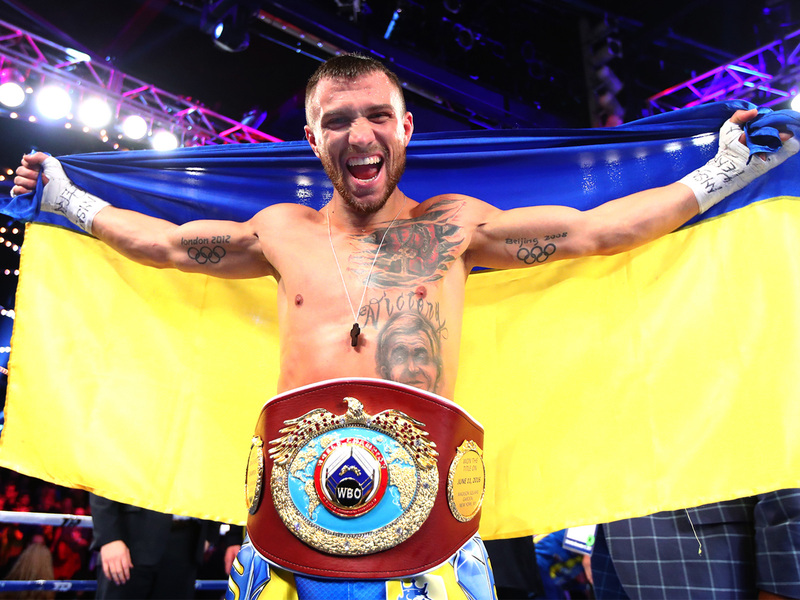 From there, Lomachenko ascended to become one of the best boxers in the world, collecting belts in both the featherweight and super featherweight divisions. He’ll fight the 44-win Linares on Saturday at lightweight, looking to continue his stretch of opponents, elite fighters like Nicholas Walters and Jason Sosa and Guillermo Rigondeaux, quitting against him between rounds. Arum watched all of Lomachenko’s victories and immediately pronounced him the most technically proficient boxer he had ever witnessed. It’s worth noting that Arum has promoted everyone from Ali to George Foreman to Marvin Hagler to Floyd Mayweather Jr. and Oscar De La Hoya and Manny Pacquiao. It’s also worth noting that Arum is as prone to hyperbole as Lomachenko is prone to knockouts. But in this case, his comparison seems apt. Lomachenko recalls a more powerful Mayweather, or a more fundamentally sound Pacquiao. He’s as elite a defensive talent as Pernell Whitaker, as athletic as Roy Jones Jr., as powerful relative to weight class as Mike Tyson–and to equally devastating results. The more pertinent question is whether Lomachenko’s profile will ever match his skillset. (He only recently corrected U.S. outlets on the spelling of his first name, which had been Vasyl when it’s really Vasiliy.) People argue to Anber that Lomachenko doesn’t belong atop the pound-for-pound ratings because he’s only had 11 pro fights. To which Anber responds: that’s the exact reason he should rank first. It’s not like Lomachenko will fight 40 times at the pro level. He won’t be able to find enough capable, willing opponents, even if he’s looking at bouts from featherweight (126) to light welterweight (140). If boxers keep quitting against him, like his last four opponents have, reinforcing his No-Mas-chenko nickname, he may have trouble getting to 25 total pro fights. “He likely may go down as the greatest fighter in boxing history with the fewest amount of professional fights,” Anber says. He’s asked if it’s possible that will never happen, possible that Lomachenko could cement his place in boxing history without the kind of bout or trilogy that defines careers. He laughs. It’s possible, he says, glancing over his shoulder at Lomachenko as the boxer glides left, then forward, then pivots off his back foot, while cocking back his left fist. It’s possible the dancer will never find his partner. But it’s the dance that matters, Klimas says.